Great card and great collection! Love your fun, patterned butterflies! Pretty cards! 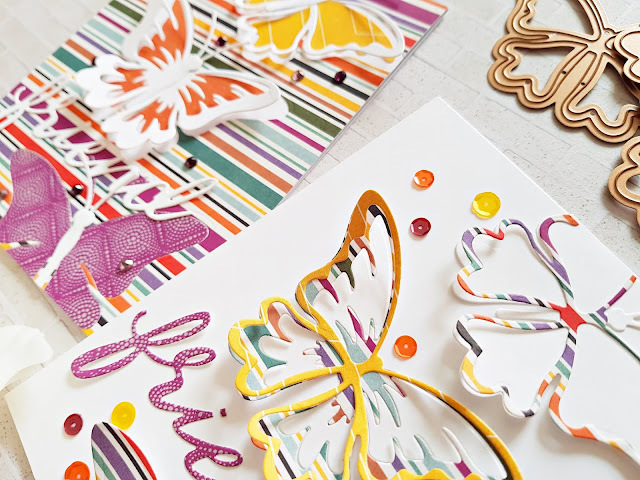 Lots of possibilities with this Layered Butterfly set of dies! What a cute idea--to use patterned paper for the butterflies. LOVE it. Great card and love the patterned paper for your butterflies. Great cards. Very creative. Love the layering. I love your colorful cards... All the layers just make them so interesting! Wow!! Your cards are really beautiful work of art! Lovely layering on these pretty cards. Thanks for the inspiration. 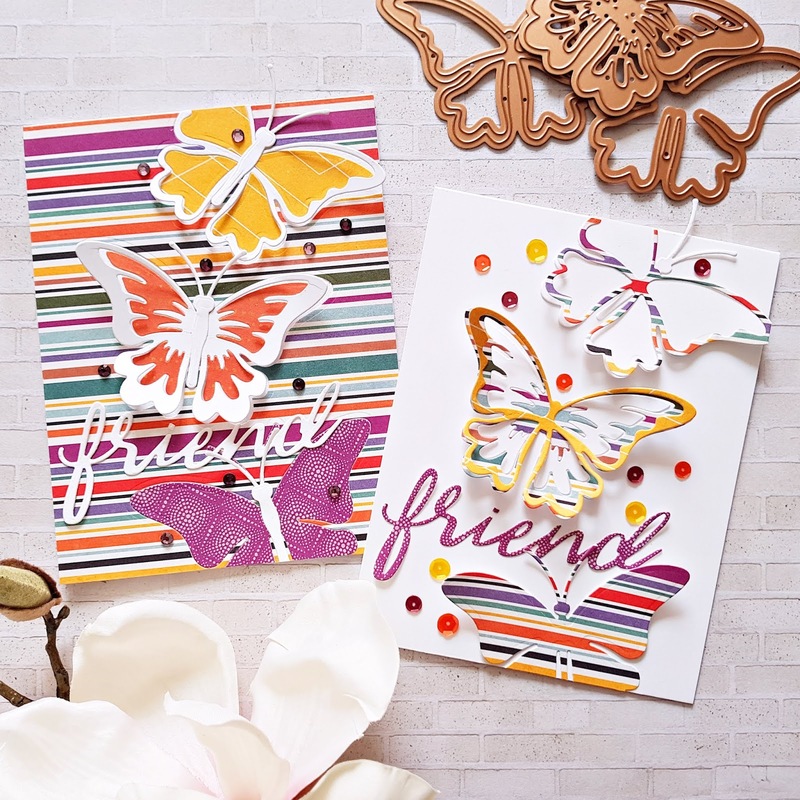 Stunning card with the new layering butterfly. Simply gorgeous. Beautiful card! The colors make me smile! Gorgeous cards! Love how cheerful & bright they are. This is such an awesome collection. Love your butterflies on that lovely background. Really beautiful. Beautiful cards. I really love the butterfly! 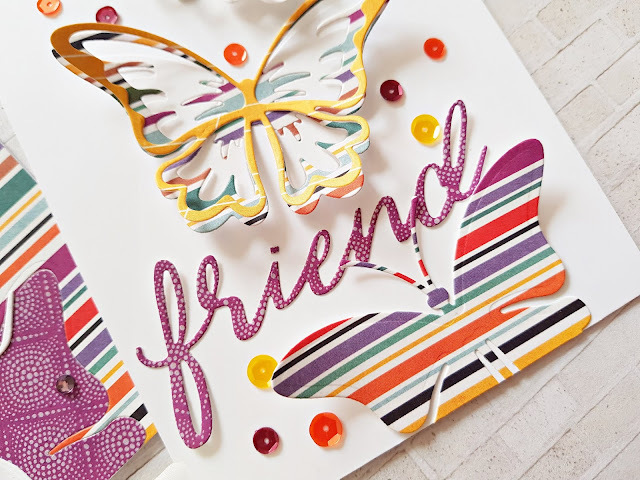 Love your use of patterned paper for the butterfly wings! The striped paper really gives these cards a bright summer feel. Great job on both cards, I love them both. GORGEOUS cards! I really love the different colors and patterns/papers that you used for making each card! Just AMAZING!! I am in awe at your use of pattern paper. Fantastic cards. Perfect paper choice and great resulting cards. What a fun way to layer these up! I don't know how you managed to stop---or did you?? 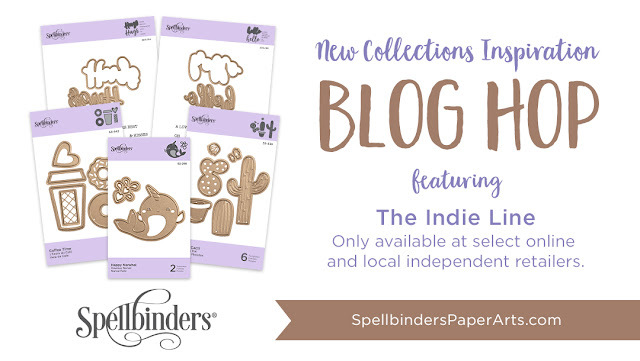 These are the kinds of projects that really put the play into paper crafting for me, and I will try every combination I can think of out of a pack of paper, then drive myself crazy attempting to pick a favorite! Love it. Thank you. I had to stop due to time constraint haha! But in the next week or so I will post 5 cards on instagram where I only wanted to make one but ended up with 5. I'm simply not capable of wasting scraps haha! I do know what you mean! Such adorable cards! Thanks for the inspiration! 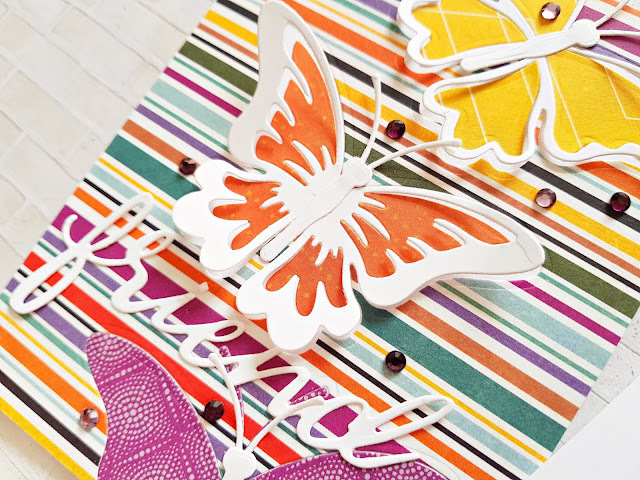 I like the colorful striped background paper on your butterfly cards. It really makes the butterflies stand out! These dies are fabulous! My wish list is getting longer and longer. Mine too haha! I didnt think I need the tree dies but seeing what some Ladies did with it on this blog hop, now I think I need them lol! Wonderful cards esp with the bright stripes. Pretty cards Zsoka. Love the fun colors and patterns... these dies are amazing. Love the details. Love the use of patterned paper & the twofer aspect! Very pretty cards!! Beautiful, unique cards. Love the paper. I liked both cards. They are lovely. I like your cards and the use of pattern paper - thanks for sharing! Such bright, happy and festive cards. I love when you can get two cards using different parts of die cuts. Fantastic! So pretty! I love how you were able to use the positive and negative for your cuts to create two cards! So very pretty!!! I love the butterfly dies!! I love the use of pattern papers with these dies. Beautiful card. Hard to not want the whole collection with all the great examples in this hop. Your cards are so beautiful and colorful, love them! Gorgeous cards!! Love the mix on colorful patterns, solids and white!! Beautiful card! I love the butterfly dies, all of them! Thanks for the inspiration! Your layered butterflies are so cool! I'm glad I have them on order from my shop!! Loving this and these butterflies! Great job. Im so excited about this collection. I love them all! WOW!!! great use of the dies and love your cards. Wonderful cards. I like the papers you used. These cards look so fun. Love the look using pattern paper gave.. Lovely. Love, love your butterflies. Thanks for the creative, unique ideas. I love the patterned paper you used, stunning work! Fantastic cards! You are so creative! I love them! !